The screen shot shows the typical Image Size dialog box in Photoshop. At the top we have the actual dimensions of the image in Pixels. This was an 8 megapixel camera image. The units of the panels can be changed using the scroll down menus alongside. Change to pixels. Note that the locks that link the width and height numbers are set by checking the Constrain Proportions box near the foot of the panel. This must be checked for the resizing process to work correctly for our purposes. 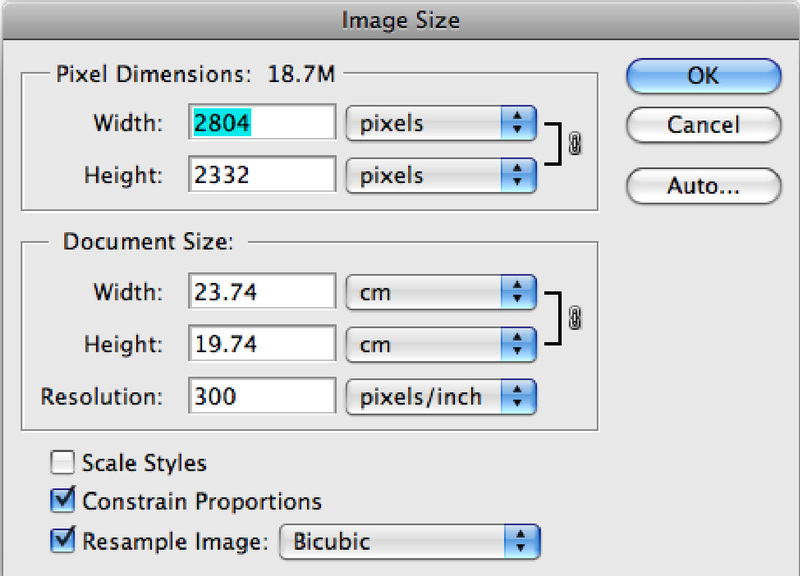 The Resample Image box must be checked before we can change the number of pixels. Choose some version of Bicubic from the drop down menu alongside. The resolution does not matter, but I use 72 or 96 pixels per inch here, which displays the image at about normal size when viewed in Photoshop at 100% on my monitor. Just type 1400 in the Width box, and the number in the Height box will change to keep the same proportions. 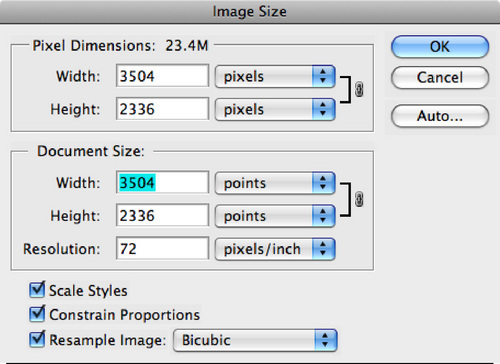 If the width figure is 1050 or less then your resized image will fit within the SXGA+ frame. If the figure in the Height box comes out at more that 1050 pixels, just type 1050 in the Height box instead, and the figure in the Width box will reduce to less than 1400 pixels, to maintain the same image proportions. Once you have a satisfactory combination with the width less than or equal to 1400 and the height less than or equal to 1050 click the OK button and then save your new image. If instead you want an XGA image which is 1024 pixels wide and 768 pixels high, then you just replace the width figure of 1400 by 1024 and the height figure of 1050 by 768 throughout the last two paragraphs . • If the aspect ratio is exactly 1.33 you can set either the width or the height and the other will fit exactly within the 4 x 3 frame. Case A. • If the aspect ratio is less than 1.33, your image tends towards portrait , and height will be the limiting factor. You set the height, and let the image width take care of itself. Case C.
If your target is SXGA+ then type 1400 in the top box Pixel Dimensions: Width. 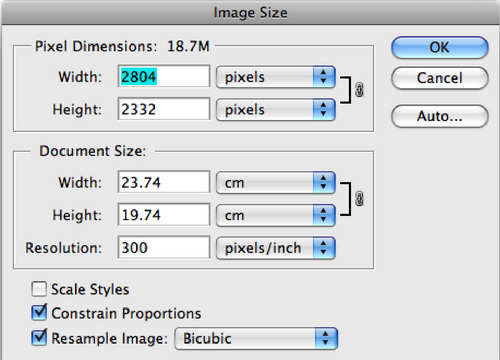 The Height box will change in proportion (to give 933 pixels for this image), as shown in the screen shot below. Notice that there is spare height available within the 1050 pixels that are available in SXGA+. To change the size we now click OK, and we are done. To change the image instead to XGA you would type 1024 in the Width box. The height will be 683 pixels for this image, leaving spare height in the XGA frame, which is 768 pixels high. In the example above the image is rather more square at 2804 pixels wide and 2332 pixels high, with an aspect ratio of 1.202. For SXGA+ we type 1050 in the Height box, which with this image gives us 1263 in the width box. This is less than the 1400 pixels of width available in the SXGA+ frame, and therefore fine. For XGA you would type 768 in the Height box and get a width of 923. Which is less than the 1024 pixels available in the width of the XGA frame. Remember that (1) for SXGA+ the width must be 1400 pixels (1024 pixels for XGA) or less and (2) for SXGA+ the height must be 1050 pixels (768 pixels for XGA) or less. Once you have a satisfactory combination of height and width you should click OK.
Save a copy as a TIFF or maximum quality JPG, according to the rules/demands of the competition or event. Note that Photoshop (.psd) documents are NOT suitable for projection.